A couple weeks ago John and I spent a few days in Newport beach with his family—and it was so much fun. One morning we got up early and snagged some treats from nearby Sidecar donuts, a bounty that included a churro donut, a cookies n cream donut, and a Mexican hot chocolate donut, among others. It was inspirational to see all the different bold but enjoyable flavors they created, and since it’s National Donut Day today, I thought I’d follow suit! 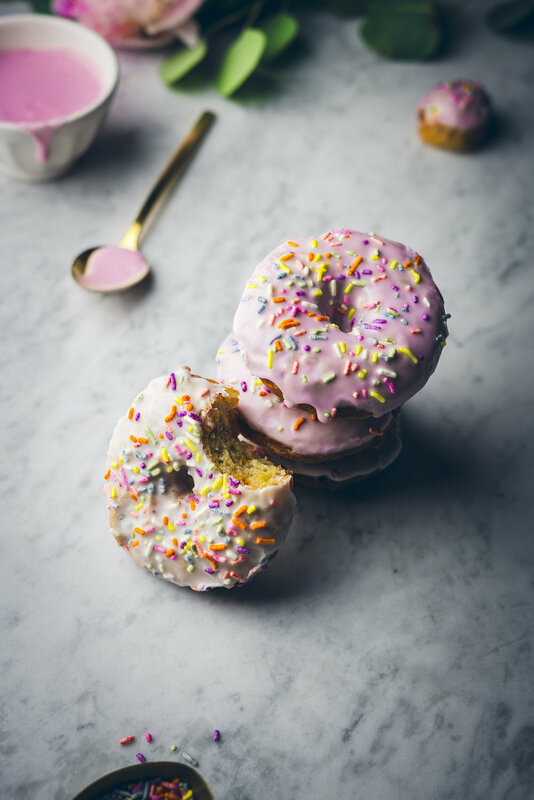 These buttermilk funfetti donuts are at once a tribute to our childhood birthday cakes of decades past and an irrefutably delicious indulgence shamelessly to be enjoyed today. They’re a ton of fun, and while they’re relatively time-consuming to create, the efforts are all well spent in the end. They bring the perfect balance of sweet and buttery, and of crispy and chewy, to bear upon the ideal donut. I’m in love with them, and if you’re looking to celebrate this day with donut of your own, go no further than the recipe below. Enjoy! Equipment: heavy-bottomed pot, 1 medium bowl, 1 small bowl, standing mixer fitted with paddle attachment, candy thermometer, rolling pin, cooling rack (optional), spatula, 3-inch biscuit cutter, and a smaller one for the center of the donut. In the bowl of a standing mixer fitted with the paddle attachment, beat the sugar and egg for 5 minutes on medium speed until pale and fluffy. Beat in the vanilla. In a small bowl or measuring cup, whisk together the buttermilk and melted butter until combined. While the mixer is on low alternate adding the flour mixture (3 additions) and the buttermilk (2 additions) until just combined. Use a spatula to fold in the sprinkles. Cover the mixing bowl with plastic and place in the refrigerator for 1 hour and up to 5 hours. Fill a heavy-bottomed pot with two inches of oil. Once the temperature reaches 365°F, add 2-3 donuts at time. Fry the donuts for two minutes, one minute on each side. Remove the donuts with a metal slotted spoon, letting the oil drip off for 10 seconds, before transferring to a cooling rack lined with paper towels. While the donuts are cooling make the vanilla glaze. Mix the powdered sugar and milk together in a wide, shallow bowl until smooth. This frosting should be thick, but still dippable, so add the additional ½ tbs as needed. Allow the donuts to cool before dipping in the glaze. Once dipped, immediately cover with sprinkles. Enjoy the same day they are made. As mentioned this dough can be a little sticky, so take your time, and make sure to have a small bowl of flour on hand. This will make the donut making process so much easier. Once the donuts are cut, I even suggest lightly flouring a spatula when transferring them to the floured baking sheet. Use a candy thermometer. It is SUPER important that the temperature of the oil stay consistent, otherwise you could end up with a soggy donut (if oil is too cold) or a very burned donut (if it’s too hot). Make sure keep a close eye on the temperature and keep it between 365°F-370°F as possible. Add some room temp oil if the temperature gets too high as you need to cool it down right away. Other than that, watch the heat often to ensure that oil temp stays consistent.